Fed up to be waked up by night call or SMS? 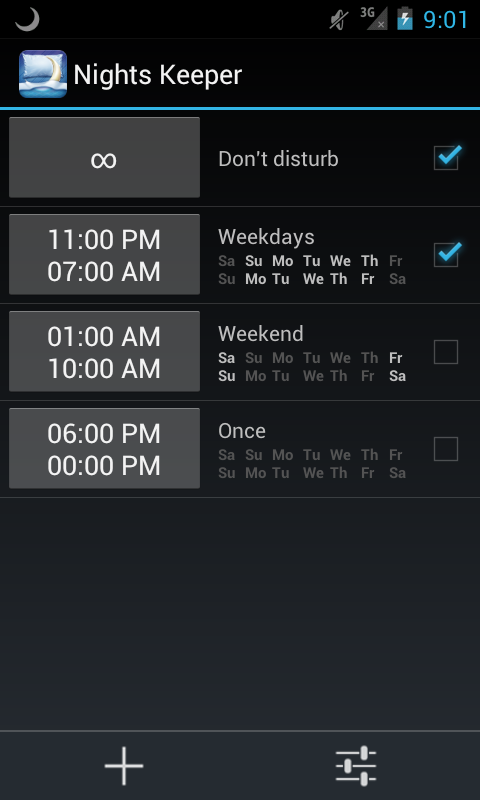 Nights Keeper protect your sleep from unwanted calls and will never let you miss important one. Today you can find Nights Keeper on Google Play! Go to bed and wake up at different times? 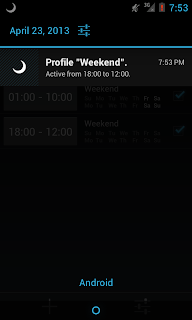 Create several profiles for different week days and enjoy every minute of your sleep. Are you afraid to miss a really important call from a loved one? 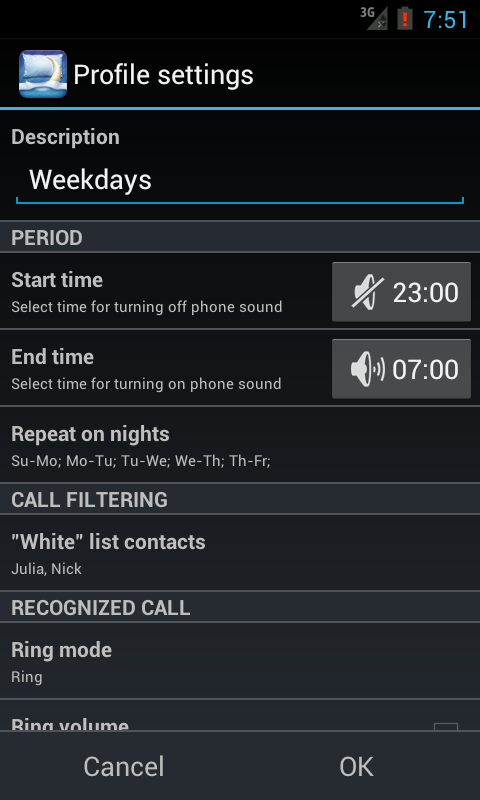 Add some contacts to “White list” and Nights Keeper will never let you miss call from them. Do not want to be rude, blocking incoming calls? 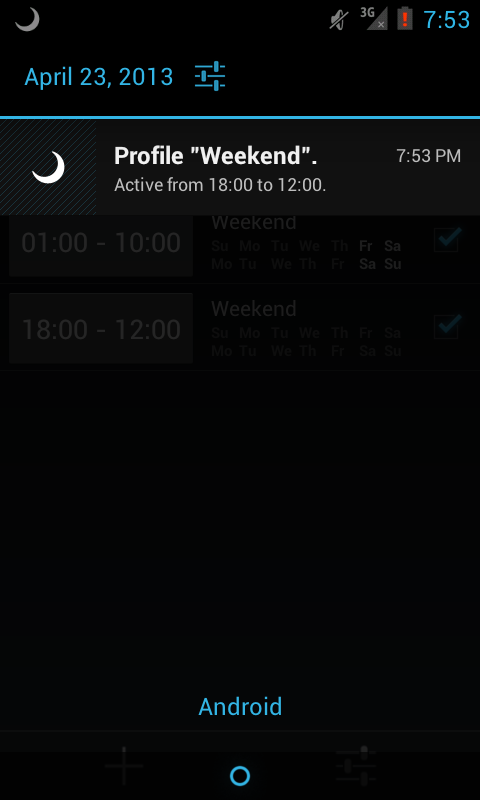 Nights Keeper will send SMS notification to the blocked caller. Forget to turn off wireless connections? Telephone discharges over night? Do not worry, Nights Keeper will turn off Wi-Fi and Bluetooth for the night. Profiles. 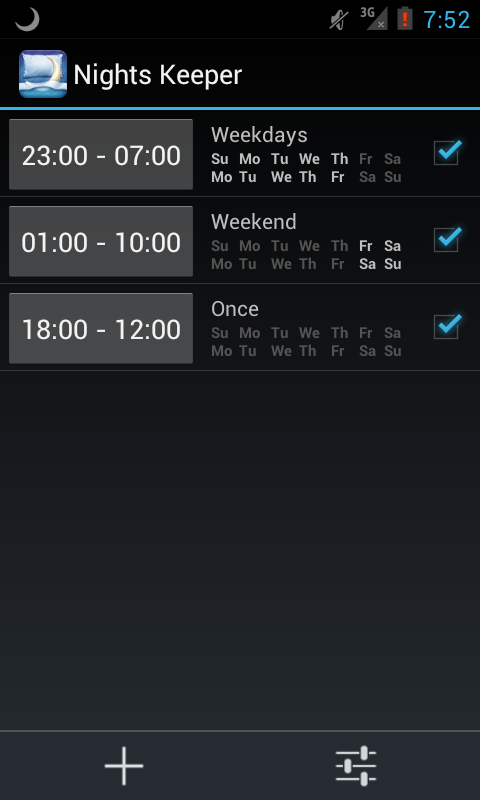 You can set different settings and start/finish time for all week days. (only one profile in Free version). 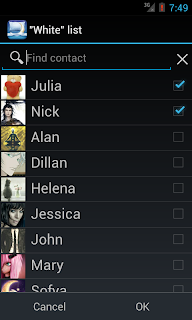 “White” contact list that can be different for different profiles. Three modes for night calls Ring, Ring and Vibrate and only Vibrate. Dark or Light application theme. Zero power consumption. 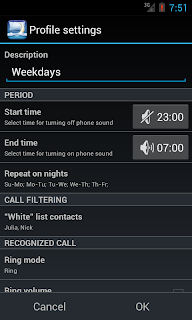 Application works only during start/finish of period or night call. PRO license can be purchased by in-app billing. Support developer and get all application features on all your devices. PRO licanse price is about 1.99$. We are going ahead to Nights Keeper release and publishing on Google Play. 1) Option “Show all contacts” (even invisible). Turn on if you can’t find some contacts. 2) Option “SMS only to my contacts”. Turn on if you don’t want to notify unknown callers. 3) Applying profile settings modification to already lunched profile. 4) Application speed and size optimization. 2) Wrong brightness in some cases. 3) Profiles with duration less then 5 minutes denied. 4) Fails in some cases. 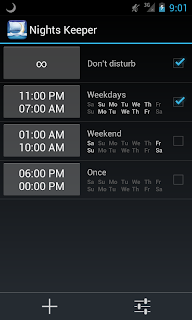 1) Exact time for turning on/off profile. It could take a long time in later version. 2) Application failed during turning off Bluetooth on some Android versions or devices. 3) Decries the delay before ringing. 4) Minor fixes in localizations. 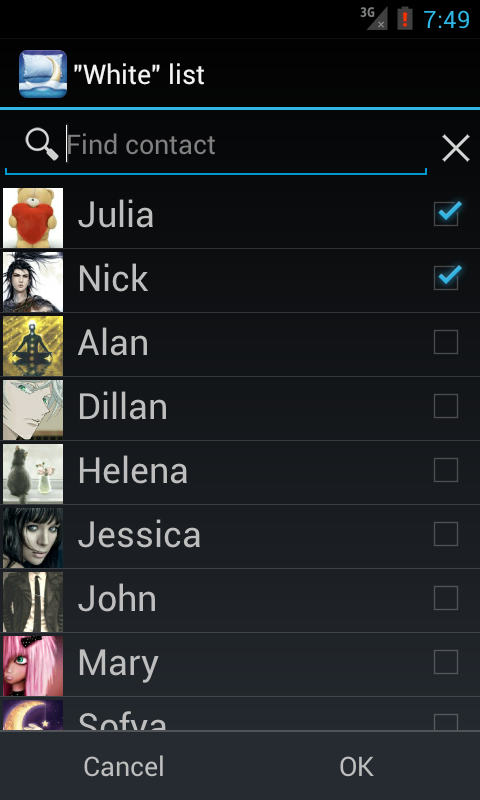 1) Selected contacts at the beginning of contact list. 2) Android version and device name in log-report message.